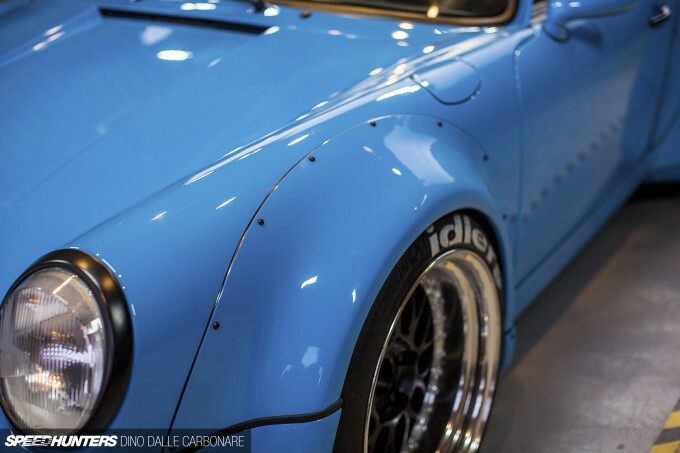 I’m not sure what to put the whole RAUH-Welt Begriff movement down to. Appreciation? Attraction? Looks? There’s certainly elements of each of those three qualities that make people from all walks of life and backgrounds fall for these race-inspired, widened 911s. Ten years ago when I first discovered Nakai-san and his wild Porsches, I thought about it all as a purely JDM style – something so ‘out there’ that only the Japanese could possibly appreciate and aspire to. 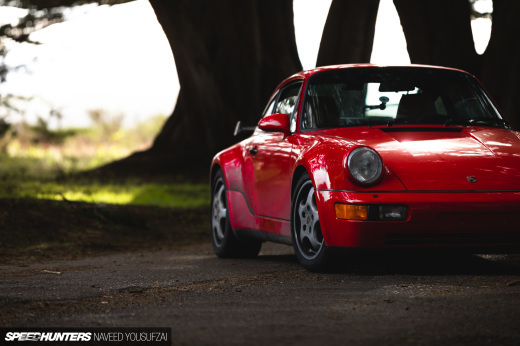 But it wasn’t until a few years after that, when I had the chance to properly get to know the man behind RWB and meet some of the owners of his creations, that I realised it was so much more. Fast forward to 2015. Nakai-san has spent most of his time outside of Japan this year, travelling from country to country building 911s of all generations and styles for an ever-growing customer base. Words can’t describe how happy I am to see RWB become such a success and known to all in the global car community. As you might have seen from the build story of Miyabi that we published last week, I was able to finally tick another thing off my to-do list when it comes to RWB. I’ve shot quite a few of Nakai’s cars, I’ve interviewed him countless time for Speedhunters and other publications around the world, I scripted him into the Retro Car Kings television documentary I did with Discovery in 2012, I’ve sat in his garage for hours shooting but also chatting, I’ve driven a couple of his cars on the street and competed twice in the idlers 12h endurance race with the RWB team – but the one thing I hadn’t done is travel to another country with Nakai and document a build from beginning to end. 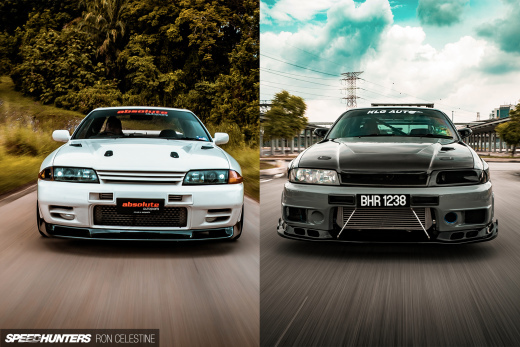 To have seen Miyabi being put together over the course of three days in Kuala Lumpur gave me a new understanding of what RWB is really all about. Sure, the cars are central to it all, but there is more to it. Nakai, in a very indirect way, has managed to create a unique following. His builds are always a show – people come and quietly watch the artist at work, and with that take something away with them. Nakai barely says a word to anyone when he’s in the zone, yet people gather around and feel part of a group. The owners of Miyabi even asked if it was okay to have so many people looking on while he was working, and he just nodded with a smile and said it was no problem. It’s not like Nakai probably noticed anyway, he obviously has an exceptionally-high level of concentration and from what I’ve seen is never phased by anything or anyone around him. That weekend he flew to KL to do one thing, and one thing only – build a car. On Sunday evening after Miyabi had been finished and we had all enjoyed another tasty feast at The Garage KL, the build area was pretty much deserted. 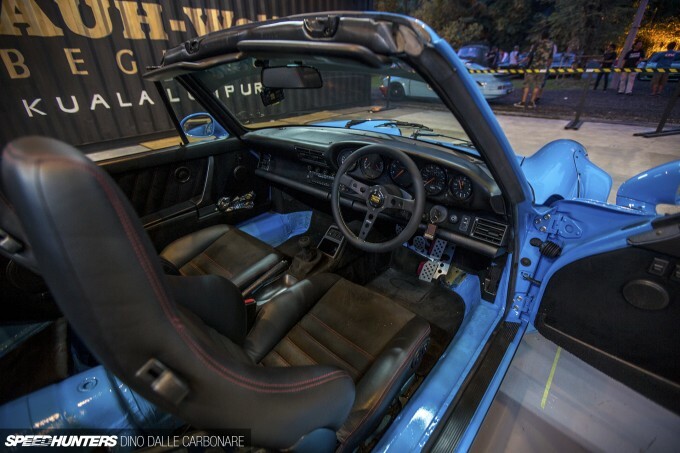 It was the perfect time to shoot the Riviera Blue 964 Carrera 2 Cabriolet. Finally, with no commotion around the car I could concentrate on all the parts that make it a very unique 911 drop top. The bumper, for example, with that black accent that Nakai sprayed on after masking out a perfectly symmetrical set of lines is a touch that I’d never seen done before. And a 2-piece skirt set that is added once the rear over-fenders are bolted to the body. 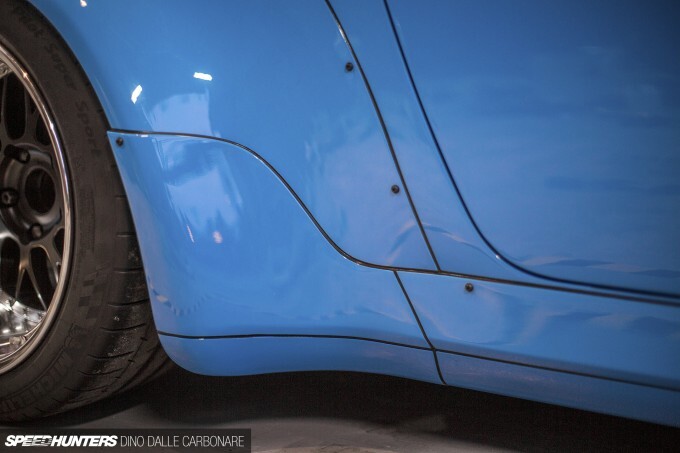 There is actually an even wider rear fender kit than this, but the guys behind RWB KL wanted to keep their first build as drivable and useable as possible. Of course, this one is more than wide enough – that becomes obviously when viewing the car from certain angles. Three-piece Work Meister M1s were custom ordered for the build with a satin black face and clear anodised barrels. The 18-inch wheels measure 10.5-inch across on the front and a massive 12-inch at the rear. The somewhat chunky 35-series Michelin Pilot Super Sports are all part of the look and stance of an RWB car; the tall but slightly stretched sidewalls sitting nice and tight with the inner wheel arch. 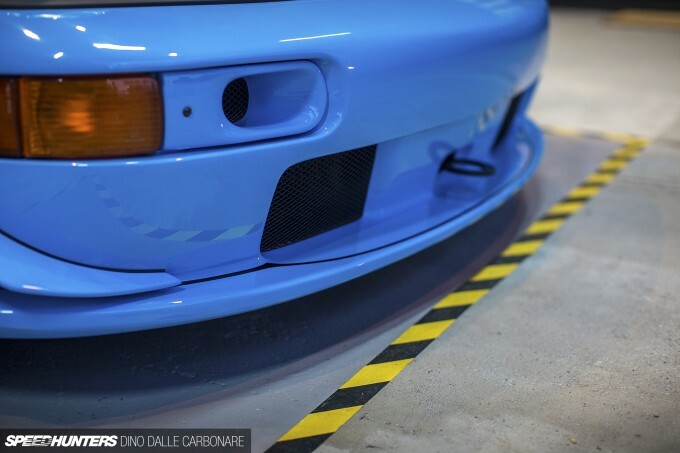 This particular detail on the side skirts is something I had never really appreciated before I saw Nakai fitting it. He cuts out a section of the rear over-fender to fit that finisher part, adding additional supports behind it all to keep it nice and tight and vibration-free. Then it all gets completed with his famous black sealant, including the secondary highlight lines that run across the centre. Being a cabriolet, I thought Miyabi really looked its best with the top down and hidden away, so that’s how I left it for this entire shoot. 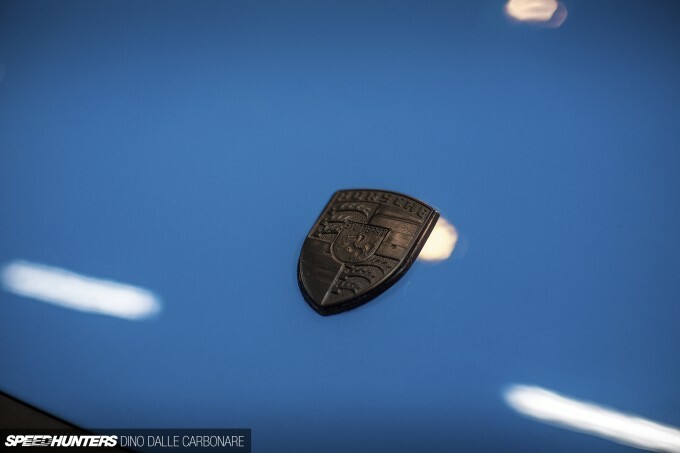 Another nice detail is the black Porsche emblem on the bonnet; one in a long list of dark contrasting additions that dot the blue exterior. For me, the defining detail of the car has to be the FRP duckbill-integrated engine cover though. I’m a great fan of these spoilers on 911s – they’re aggressive yet subtle, and work even better on a convertible car. Nakai carefully aligned it on the car and then finished up with the black grille section to ensure the engine has enough air to keep itself nice and cool. Along with the vented rear bumper and those canards up front, the 964 was finished off with just the right number of details. Before Nakai-san even arrived in KL, the originally-red base car was stripped down and painted inside and out. While the interior was out the owners decided to spruce things up in the cabin, which resulted in a complete leather and Alcantara re-trim finished off with red stitching that extends to the door cards. Elsewhere, worn out bits of trim were replaced with factory fresh items. 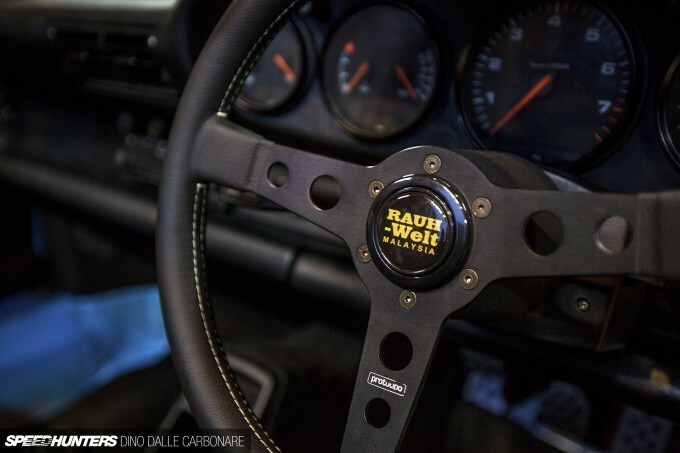 The refreshingly-simple 964 cabin then got a few final touches, like the Momo Prototipo steering wheel sporting the RWB Malaysia horn button and a set of Rennline pedals. 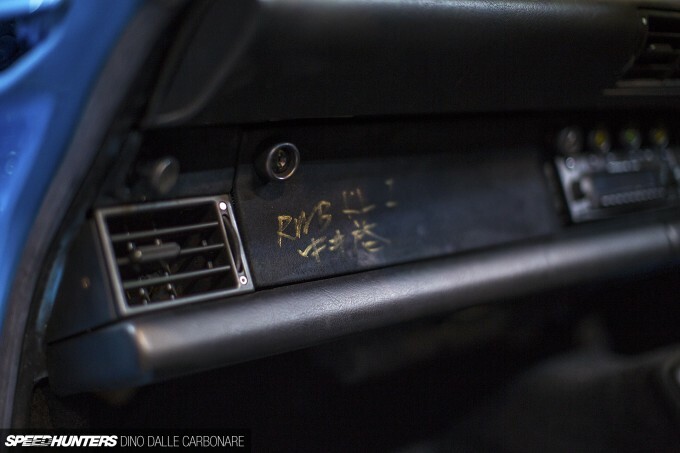 Once the car was all completed and everyone had left, Nakai was asked to sign the dashboard, thereby certifying Miyabi as the first-ever RWB 911 build executed in Kuala Lumpur. By this time of the night it was only myself and Nakai in the build area – me shooting, he calmly packing away his mobile tool chest. We had a little chat as I was wrapping up my last few shots and talked about how fun Malaysia had been, his next destination and the crazy amount of cars he still has to build before the end of the year. It was definitely a memorable experience spending three days with someone I regard as one of the most important personalities in global car culture today. What was a stock Carrera 2 Cabriolet just a few weeks prior to the RWB transformation is now one of a very select group of Porsches around the world, and its owners are going to have a blast driving it on the street and the track. With a freshly rebuilt engine this 964 is going to be used to its fullest, so if you are located in or around Kuala Lumpur you might want to keep your eyes peeled for it. 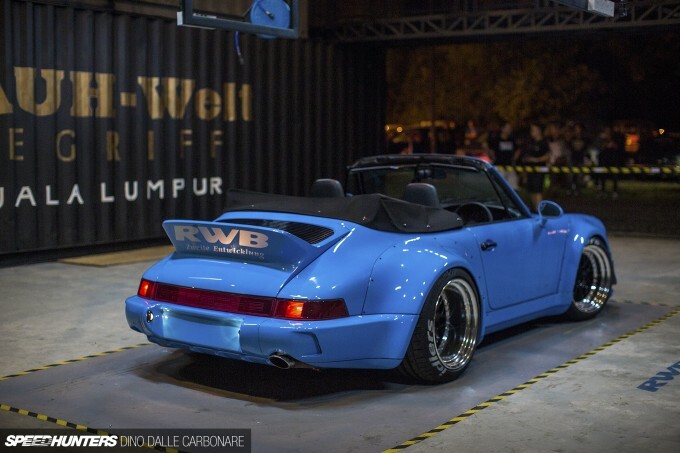 This is only the beginning for RWB KL too. There is definitely interest brewing in the local Porsche scene and Miyabi may very well be joined by another Nakai-san build in the not so distant future. Owning or lusting after an RWB Porsche is all about wanting to be part of something a little different. It isn’t for everyone, but for those that get it and just can’t get enough of this style, it really ends up being something you live and breathe. And Nakai is good at keeping that attraction alive, he makes you feel part of a group, a team – a family. How come it has three owners? I mean, how does that work? In Malaysia cars are not 'tied' to a certain person? Maybe it was registered under company ? I had been told this is actually a demo car to a KW suspension dealer or something . Those Far East countries really do stick it to car owners, so I could totally understand a bit of dancing to beat the system. This is a demo car for the Malaysian KW Suspension distributor, hence the 3 owners. I heard all 3 of them foot the bill together for this. Beautiful car. That color with black trim is perfect. Looks a little lacking with one exhaust and an empty cutout one. Buick Man Just put the fenders on before repainting, then bondo over the rivets. my favorite parts are definitely the blacked out porsche emblem and the chunky tires idk why. engine is the only weak part but even that dosent hurt it everything else looks nice but those 2 things stood out for some reason oh and the rwb horn button haha simple quality build but nothing more nothing less just the right amount of radical. Perfect as always. Pure japanese fighter style. Man, those lines of sealant are so perfect, it blows my mind! There's a real difference between what a man with experience and an eye for perfection creates. Compared to what a machine spits out time after time. The result may be the same, but feeling you get from admiring the result couldn't be more different. Amirite?! Yeah, you know what I'm talking about. This is Nakai-sempai with a grease gun. Do you only post the offsets when that info is available or are offsets Top Secret? Some people are weird about offsets, like it's the Colonel's secret recipe. Ahhhh yes very neat, much better than the usual over kitted RWB cars. Not that's a bad thing but sometimes less is more. OscarPais I post when I know them! Insert inevitable comment about untreated metal on the fender cuts. Seriously though car is absolutely beautiful. I want one badly. Nice! No pictures with the top up? See it's timeless. Too awesome to die. is there any cabriolet RWB Porsche before? this is my first time seeing a cabriolet RWB. 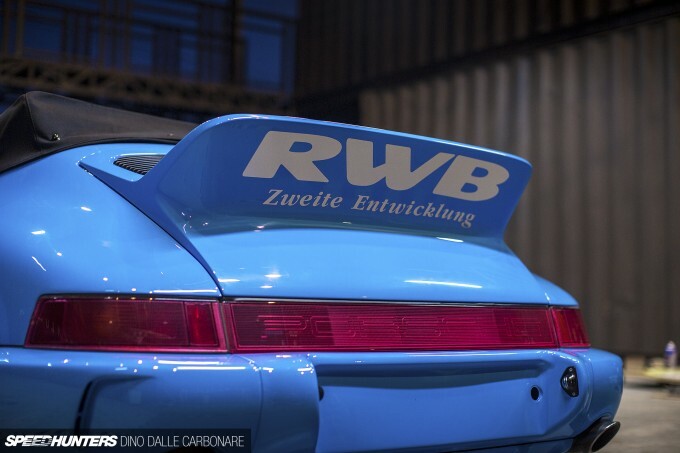 I would like to see a cabriolet RWB with that big RWB wing. Will it rust under the plastic fenders? It has been cut without using any rust protection. What about all that untreated metal on the fender cuts? deleted_82067014_Abezzegh87 Why would you assume that? You've been there? It was such a pleasure to witness the Master himself in person working on what is now my favourite RWB Porsche. deleted_82067014_Abezzegh87 WE MLESIANS HAVE NO SUMMER!!! HAHA!! It looks awesome and all, but it would be about a million times better if it was a hard top instead of a convertible! FathiHaziq koko san Oh thanks! Looks ok...not too bad. deleted_82067014_Abezzegh87 Actually the cuts where pinstriped by an invisible master during the night! Damn you Dino for making me like a convertible! Okay but seriously wide bodied Porsches are the mutt's nuts. Damn good job. Damn good bloody good damn good job. I've seen a RWB creations with aparently metal fender flares... I mean for example the 964 of Hiroyuki Makabe and others (I think could be the narrow body option). Have you seen one of these creations, Dino? Is that an option of Nakai San or a custom special order? Equally I am only can express my respect for Nakai San and his passion. It inspires me a lot. ps. I think this car could be even better with the bottom skirts painted in black, the colour contrast could be definitive. muazyusof 'Hyakka Ryouran' is a cabriolet. The first on Malaysian soil before 'Miyabi'. Looks great, but red stitching with blue exterior, really? Colour matched blue stitching would be much more impressive. Give me one with a roof and I'll be happy forever! 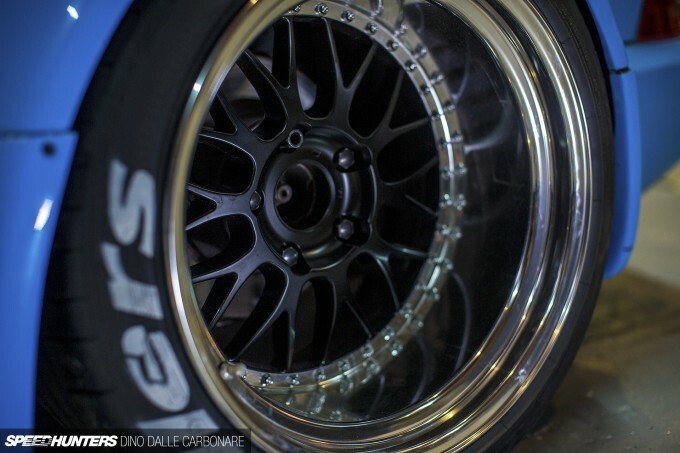 How much did the RWB build cost inclusive of the rims? And who should I speak to if I was interested in doing it?